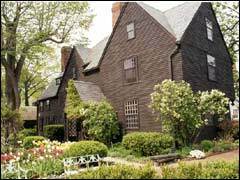 In his romance The House of the Seven Gables Nathaniel Hawthorne created three distinct female characters who exemplify types of women throughout his fiction. Hepzibah Pyncheon, the timid lady aristocrat of another era, bravely but often ineffectually attempts to run a Cent Shoppe as she protects and nurtures her brother Clifford who has been wrongly imprisoned for thirty years. Phoebe Pyncheon, the lovely, practical country lass, manages the Cent Shoppe easily as she brings cheer and energy into the dismal lives of her cousins Hepzibah and Clifford; Phoebe also brings tender love to the daguerreotypist Holgrave. Alice Pyncheon, a bold, independent and sharp-witted ancestor of Hepzibah and Phoebe, becomes enslaved to the wizard/carpenter Maule.